St. AUGUSTINE, Fla. — Even before Jamestown in Virginia and Plymouth Rock in Massachusetts, there was St. Augustine. In 1565, Spanish admiral and explorer Don Pedro Menéndez de Avilés landed at the mouth of the St. Johns River and established what is known today as the oldest continuously occupied European settlement in the United States. The city’s fortress, Castillo de San Marcos, still stands as an emblem after half of a millennia of warfare, Florida’s notorious hurricanes and thousands of visitors. 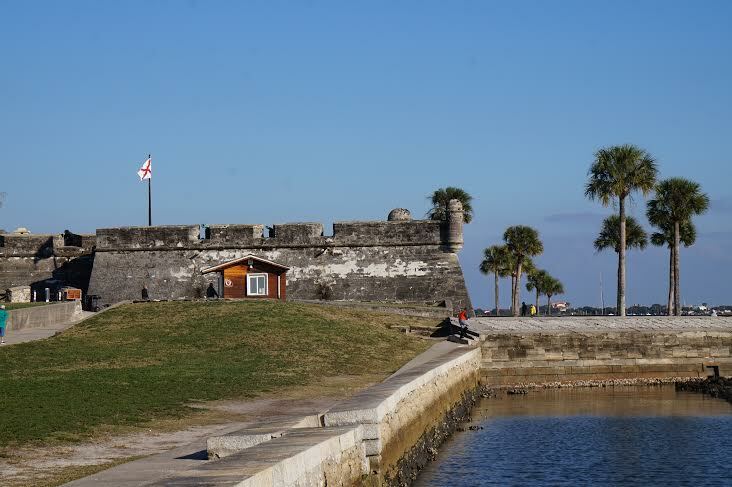 St. Augustine, Fla., and its fort, Castillo de San Marcos, are part of what is known today as the oldest continuously occupied European settlement in the United States (Photos by Hayley Canal). Castillo de San Marcos is a national monument that is part of the collection of natural and historical sites protected and preserved by the National Park Service and U.S. Department of Interior. The park service says the site offers the oldest masonry and only existing 17th century fort in North America. The fortress has withheld 300 years of brutal bombings from the British and Americans alike. But nothing would prepare it for the kind of damage it would receive from the flocks of curious visitors and the naive restoration movements of the early 20th century. Chris Leverett, Historic Weapons supervisor who has worked eight years on the site, said there is always ongoing maintenance to keep the monument as historically sound as possible. “Our masons will never be out of a job,” he joked. 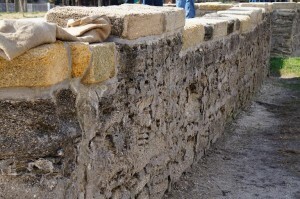 The walls of the fortress are made of a unique sedimentary rock named coquina. Coquina works as a natural cement in that the shells that it is composed of, compress after thousands of years and are sealed by calcium that is released. Despite its obvious strength, it is fragile and susceptible to wear. The fort’s walls are made of of a unique sedimentary rock named coquina which have upheld brutal bombings for 300 years. 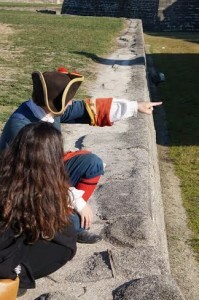 A crack that ran along one of the entire bastion’s vertically — San Pedro’s Bastion — was not filled in until 2006. Leverett explained that the mortar is installed an inch or two behind the blocks and has to be softer than the stone so it can give way. Chris Leverett, Historic Weapons supervisor, explained that the mortar is installed an inch or two behind the blocks and has to be softer than the stone so it can give way. “Coquina works like a rubber band,” Leverett said. In the early 20th century, movements made to restore the monument made a crucial mistake: all repairs were made with portland cement. Efforts to remove the patches of cement have been made since 2003. 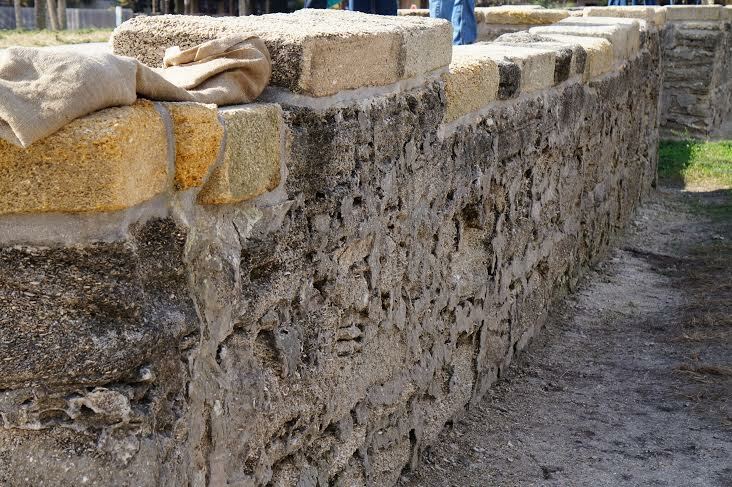 But because the removal process also damages the walls of the fort, the team of masons has been careful when picking and choosing what areas absolutely need repair from what areas can remain intact. “When the building was brand new, it was plastered white,” said Leverett, “it is this white plaster that would essentially preserve the monument.” However, polls have been taken, visitors have been asked, and the crowds simply don’t want to see a white fort. 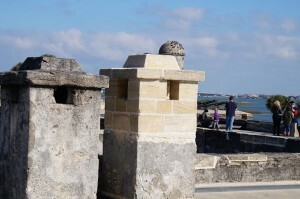 Click on the video at right to view an audio slideshow about preservation of Castillo de San Marcos prepared by writer Gabriella Canal. Park visitors wants an old, rustic look in order to preserve their idea of authenticity. Some argue that the white plaster and red lining would imitate that of a Spanish look — a look that only tells one side of the fort’s story. “The way we’ve decided to manage the castillo is in its current state. We’re not trying to take it back to what it looked like when it was first built (white plaster with red corners),” said Steven Roberts, the site’s new chief of interpretation. The portland cement and red bricks that can be found in the walls today were put in place by the Americans during the Civil War, Spanish American War, and Seminole War of 1835-42 war. To cover the walls with white plaster would be to mask the full history of the monument. Visiting for the first time from Fort Myers for a recent Thanksgiving weekend were tourists Sylvia Wagstaff and her 11-year-old granddaughter, Elizabeth Wagstaff. Both had been unaware that the fort was once white and that this white plaster could potentially further protect the historic site. “White plaster would not bother me at all. It’s silly that imagery is prioritized over preservation,” said Sylvia. In 1938, the moat that surrounds the fort was filled with water for entertainment purposes, but drained in 1996 when significant cracks were being made to the wall’s foundation. Railings that had been placed in along the top of the fort’s 35-foot walls were historically intrusive to look at and taken down then replaced with a warning sign before the staircase. Recently, the proposal of an installation of gutters that would protect the stone walls from the deterioration that drainage can cause was denied. Last year, the proposition of replacing the entire chimney that was cracking from the portland cement raised long debates because policies of the National Park Service prohibits the physical alteration of a monument if it is intrusive. The argument the monument’s headquarters used was that it was likely to fall and caused a safety hazard. The chimney was quickly replaced and the suggestion to plaster it was as quickly denied. The replaced chimney is the one at the right. Pollution is another challenge that the park rangers must face. “The bronze plaque that once hung over the front entrance of the fort was taken down in 2003. What we found underneath was a much whiter wall and it was only installed in the 1920s,” said Leverett. Exhausts from cars and contact with visitor’s hands are part to blame for the darkening of the coquina. “The biggest challenge with managing and taking care of a 342 year old structure is that it sees more people in one day on most days of the year than it was ever supposed to hold in a siege,” said Roberts. On average, 2,500 to 3,000 people visit the fort in one day. The site is open 364 days a year. In 2013, the fort saw a grand total of 700,000 visitors — 80,000 of them being school children. Crutchfield admitted that the majority of the deterioration and injury come from the visitors who like to touch the stone and walk on the walls. All of this ongoing maintenance is paid for mainly by revenue made from the entrance fees. 80% of that money comes back directly to the park. “We’re not just here to look over the castillo for a couple of years, but to keep these national resources available for all time,” said Roberts. At 10:30 a.m., as ritual, the guests were thanked for their contribution to the monument as the ancient 1740s, six-pounder iron gun shot off a cannonball over the bay– piercing the clearness and quiet of a still morning.